We believe it is important to support ourselves as much as possible and we rely heavily on selling hand-made products by the children and the mothers. You can purchase any of our products directly at the home if you are volunteering or by emailing us at baandadavolunteer@gmail.com with the product, colour and size and we can arrange payment via our paypal. Please, title your email ‘Webshop purchase’. We employ one woman to weave products to raise money for our home. In exchange for a reliable monthly salary, she makes unique products for us to sell through volunteers and our website. Products are available made-to-order too. If we don’t already have an item in the colour you are interested in, she can make one! A few of the older girls have been getting sewing and weaving lessons and are now also making these products. They sell them at the Saturday night market in Sangkhlaburi. The money earned goes into their own bank account to help save for future further education. 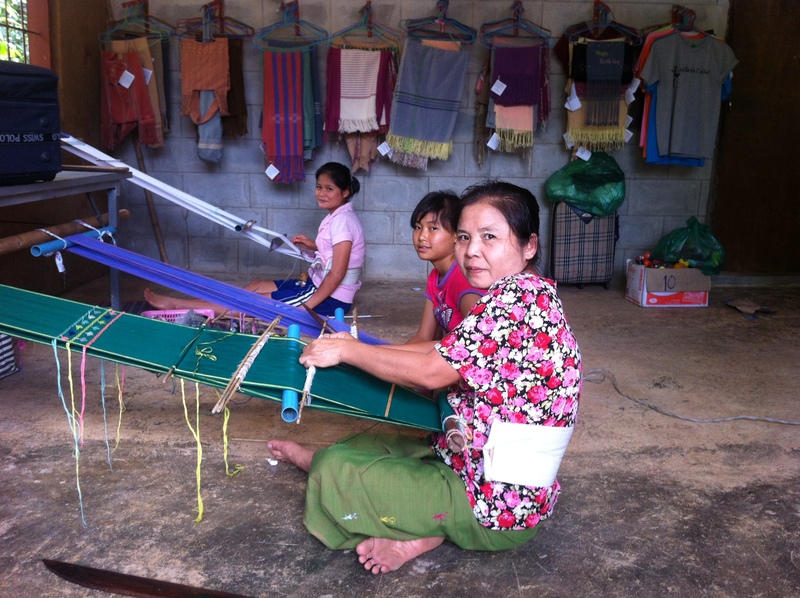 Now at Baan Dada, you can Learn Karen Ethnic Style Cloth Weaving! Taught by the children, it is a fun skill to learn and at the same time you will be helping these children save money for their future higher education. Cost of 6 sessions is only 1,000 baht. This includes the material to make a scarf and you can take home what you make! More details can be found once you are here. If you are interested in seeing photos of weaving or know someone who would be able to sell them through a local store in your community, please email us at baandadavolunteer@gmail.com! Check out our weavings below! If you are interested in purchasing a bag, please email us at baandadavolunteer@gmail.com with the subject of the email ‘Webshop purchase’. Please tell us in the email the size and colour bag you would like. The children at Baan Dada make items such as bracelets, bookmarks, cards, and keychains to sell at our shop and local markets. The children are given an allowance for each item they make, which they can spend as they wish. Check out what we have for sale below! Various card art available: holiday, friendship, cartoon, creative drawings, etc. Laminated bookmarks with various art styles, including photos of the children. Keychains of various styles and colors with beautiful beads. If you are interested in purchasing something made by the children, pleae email us at baandadavolunteer@gmail.com with the title of the email ‘Webshop purchase’. Please tell us in the email the handmade item you would like and how many. One of our older children, Ramesh (aka Rambo), is a very talented landscape painter. He sells his canvas paintings in galleries in Singapore, England, and Thailand. Ramesh also teaches other children in the community how to paint so they can create and sell their art. This is a wonderful way to encourage Ramesh to continue practising art, whilst also sponsoring his university education. 100% of the profits go towards education fees and medical expenses. Prices range from 200 TBH for smaller pieces to 2,000 TBH for the larger canvases. If you are interested in purchasing a painting for you or your gallery, please email us at baandadavolunteer@gmail.com. Below is a slideshow of some of Ramesh’s work! Want a souvenir of your time at Baan Dada? We now have volunteer t-shirts for sale. There are several colors to choose from, blue, lime green, orange, and white, and come in 4 sizes, x-small, small, medium and large. You can buy these at Baan Dada in the Handicraft Shop or we can post to you for the cost of the t-shirt plus postage costs.